One of my search strings got a hit today. Based on the already known model number 101 I found this Windows Experience Index CPU score of an AMD "A10-9600P" APU (Bristol Ridge). It's a quad core (2 modules) with 6 CUs and a reported base clock of 2.3GHz. A CPU score of 7.4 isn't that low, but doesn't tell us that much more, except that the system was able to finish the benchmark test. The result currently sits on page 7 of the filtered list linked by the table screenshot. You can also click the other images for the respective sources. According to another page the listed model is a HP system, very likely a laptop. 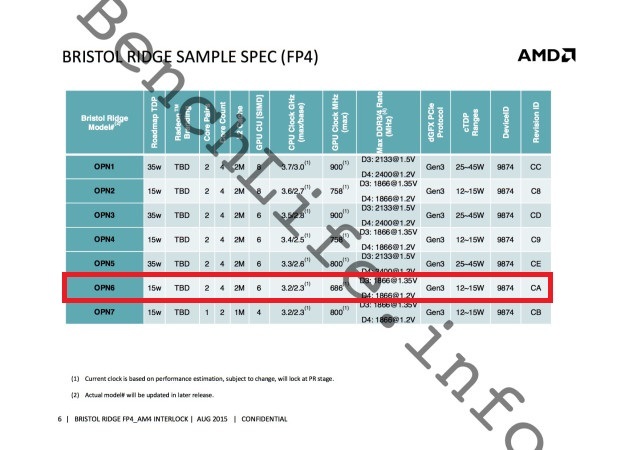 As can be seen in the leaked slide below, the found CPU might be the a quad core with a cTDP of 12-15W. After the first listing of a Bristol Ridge SKU ("FX-9830P", thx @Onkel_Dithmeyer) and some BR ES traveling through the world, we now have a first Bristol Ridge APUs reporting the final product OPN instead of a typical ES string. Perhaps this is a system to be shown at CES?